Markham is a neighborhood in the Southwest section of Portland, Oregon. 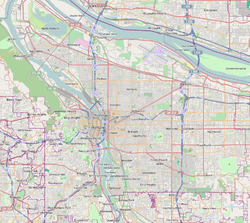 Markham is bordered by Multnomah and South Burlingame on the north, Marshall Park on the east, Arnold Creek on the south, and West Portland Park on the west. Part of Maricara Natural Area (1988) is located in Markham (as well as in Arnold Creek). This Multnomah County, Oregon state location article is a stub. You can help Wikipedia by expanding it. This page was last edited on 20 February 2017, at 15:33 (UTC).